Shout! 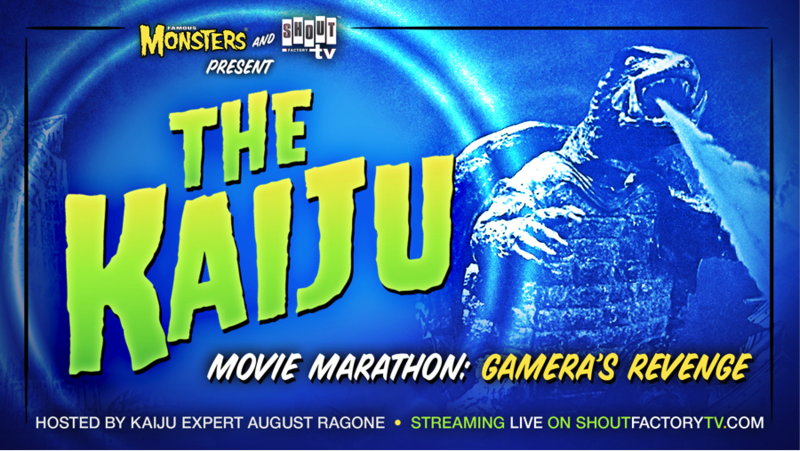 Factory TV & Famous Monsters of Filmland Present THE KAIJU MOVIE MARATHON: GAMERA’S REVENGE, Premiering on Shout! Factory TV on 10/17! Following the success of Shout! Factory TV’s Kaiju Movie Marathon in July, Shout! Factory TV has once again teamed up with the monster magazine Famous Monsters of Filmland to bring you the Kaiju Movie Marathon: Gamera’s Revenge! Featuring 11 Gamera films and hosted by Kaiju expert August Ragone the monster mayhem will stream live for 16 hours on October 17 from 8am ET to midnight ET. The marathon marks the 50th anniversary of the first Gamera movie release in Japan. The Kaiju marathon comes complete with original introductions by renowned Kaiju authority August Ragone, commenting on the history and impact of these classic films. A two-time Rondo Award-winning author of Eiji Tsuburaya: Master of Monsters, Ragone has commented on Japanese film and popular culture on radio, television, in print, online, and at events for more than three decades. The event will be streaming at www.shoutfactorytv.com. For mobile, tablet and connected TV devices the marathon is accessible via the Pluto TV app. The marathon is also available via Pluto TV (CH 427), in the living room (Amazon’s Fire TV and Fire TV Stick, Android TV devices, Chromecast and Apple Airplay), on the go (apps for iOS, Android and Amazon) and at your fingertips on PCs, Macs or on the web. Prepare yourselves for something monstrous (again)! Tune in for Kaiju calamity and live tweet with #Gamera. August Ragone, as well as other Kaiju super-fans, will be tweeting and sharing fascinating Kaiju knowledge. Shout! Factory will be offering various prizes to viewers through the marathon, including copies of Ragone’s book, limited-edition “I survived the Gamera marathon” blankets, Famous Monsters of Filmland monster poster, among other items. Pop Culture. Sci-Fi. Fantasy. Horror. Famous Monsters magazine covers it all, living up to its classic title while staying current — and ahead of the curve. The first and finest genre fanzine created by Forrest J Ackerman in 1958, the internationally distributed FM has always been influential within the entertainment community while fostering fan excitement for decades. Our Captain Company (www.captainco.com) sells all manner of monster goodies, and we’ve moved beyond the page via social media and famousmonsters.com. Often imitated. Never duplicated. Famous Monsters is the winner of the 2015 Rondo Award for Best Classic Magazine.